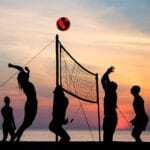 Outdoor volleyball net systems are in high demand for tournament, scholastic and recreational play. Park and Sun Sports is one of the premier manufacturers of portable, easy-to-setup, and durable outdoor net systems. 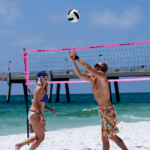 Park and Sun Sports is said to have redefined outdoor volleyball net systems when they developed and introduced the Spectrum volleyball net series. 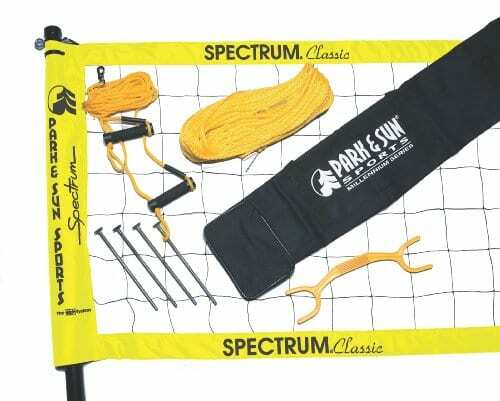 The Park & Sun Sports Spectrum Classic portable outdoor volleyball net is the flagship of the Spectrum series. 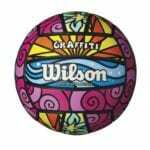 It is suitable for professional-level volleyball, featuring lightweight telescoping aircraft aluminum volleyball poles, original sleeve net design, and colorful net tapes. 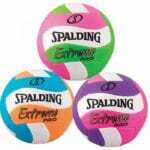 The Spectrum Series, especially the Spectrum Classic, is perfect for volleyball games at parks, beaches, tournaments, and leagues. The Park & Sun Sports Spectrum Classic features two-inch diameter telescoping poles, with a push-pin locking system that easily adjusts to official men’s (8′), women’s (7’4″) and co-ed (7’8″) official volleyball heights. The poles are made from durable premium powder-coated aircraft aluminum to ensure durability. 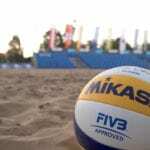 The Spectrum Classic features the volleyball regulation size Spectrum net, which measures 32′ long and 3′ high. 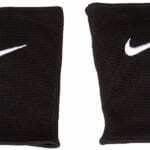 The net tapes are 3″ top and bottom with reinforced corners and 6″ side sleeves. 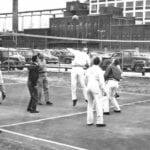 The sleeve net design keeps the net taut for competitive play. The Spectrum net is pre-attached to the poles. The guyline system with padded pull-down handles allows for quick tension adjustment. And the 12-inch steel ground stakes provide maximum stability during aggressive volleyball play. With the Spectrum Classic, it easy to define your court boundaries. 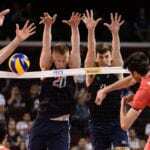 The volleyball set comes with 5/16″ diameter, pre-measured boundary lines measuring 60′ long and 30′ wide. The boundary lines are firmly secured to the ground with corner anchors. Also included is a cord winder to keep the boundary lines wrapped up without tangles. The entire Park & Sun Sports Spectrum Classic set fits inside a heavy-duty 1800 denier polyester zippered equipment bag with carrying handles, which makes storing and transporting extremely convenient. No ball and air pump included. (get a top-notch ball). 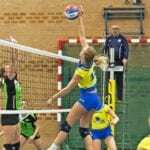 Overall, the Park & Sun Sports Spectrum Classic volleyball net system provides professional-grade play, quick set up, and convenient portability. 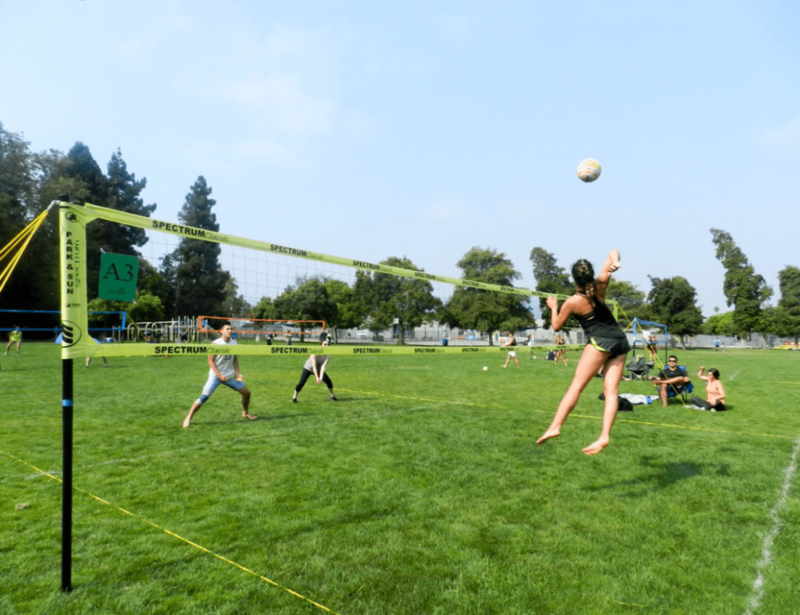 If you need a professional level portable outdoor volleyball net system that is perfect for all volleyball skill levels – then look no further because the Park & Sun Spectrum Classic Volleyball Set is a true winner. We hope you found this Park & Sun Spectrum Classic review helpful.